Sabering, or sabrage, is a champagne-opening art popularized at the time of Napoleon's military campaigns. 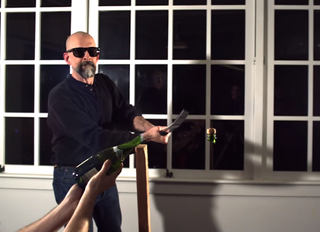 In this video, Neal Stephenson, the author who gave us Snow Crash and Cryptonomicon, shows that doing it properly requires not blunt force, but elegance, precision and a knowledge of physics. A bottle of champagne is under around 90 pounds of pressure per square inch. The diameter of the opening is less than 3/4-of-an-inch wide, so a force of roughly 35 pounds is continuously pushing on the cork. In the early years of champagne-making, thin glass bottles would routinely burst in the cellar, as secondary fermentation released carbon dioxide and further increased the pressure in the bottle. That's the reason champagne houses added wire cages to hold in the corks and and thickened the glass. A lip at the opening of the bottle creates a stress concentration, while on the vertical seam of the bottle there is a prepared and barely visible seam, which creates a second stress concentration. Where the seam and the lip intersect, both stress concentrations combine. This means that the strength of the glass is drastically reduced. But when slicing with a sword, why does the lip come away cleanly, without shards flying everywhere? Glass is made up of molecules arranged in a crystalline structure, a rigid pattern iterated over and over again, like a kids' climbing structure. This structure is made when the molten silica is cooled and solidifies. The solidification process is fast, and often doesn't give every part of the structure a chance to get into place. As a result there are places where the regular pattern does not match up; invisible cracks in the glass. It is due to these cracks that much glass shatters so easily. Some glass has to be much sturdier than the average water-bearing cup, and so manufacturers go through a process called annealing. Molten glass is held at just below solidification temperature so that all the minor tears and misalignments can sync up. The result is extremely crack-resistant glass like pyrex baking dishes or, to a lesser extent, champagne bottles. But, annealing can't get rid of all the tears in the glass, especially at stress points, such as where the seam and lip intersect. The weak point is actually a linear network of tiny cracks. When struck by a sword, the cracks widen and join up with other small cracks, and the bottle is cleanly decapitated.